This week, 14-year-old Jamey Rodemeyer from New York ended his life after being persistently bullied on a social networking website. Despite talking about being bullied and asking for help repeatedly, nobody did anything to comfort him. And so when nobody seemed to acknowledge or care about his pain, he tragically ended his life. Every time I’ve thought about this story, I’ve felt a range of emotions, from chills and sadness to outright anger and disgust that nothing was done to help Jamey. The scourge of cyberbullying has increased alarmingly over the past couple of years. Defined as the use of communication technologies for “persistent and repeated” harassment of individuals, cyberbullying magnifies the effects of traditional bullying. The fact that many cases involving adolescent cyberbullying have ended with tragic outcomes like suicides underlines the grave nature of this menace. There has been national and international recognition of the hazards of cyberbullying at the highest echelons of power, from the White House to the British House of Commons. Just like spam once threatened the viability of email, cyberbullying now casts a dark shadow over social networking websites. Most of the current work focused on cyberbullying involves surveys to gauge its prevalence and awareness campaigns led by parents and school administrators. While these approaches have their place, there has been very little use of technology to tackle this problem. Last fall, after watching a segment on cyberbullying by CNN’s Anderson Cooper, I began to wonder if there were any efforts to use computational linguistics to help detect textual cyberbullying on social networking websites. My thoughts found immediate and strong support from a fellow graduate student, Birago Jones, and my Media Lab advisors, Dr. Henry Lieberman and Professor Rosalind Picard. We decided to pry further into this topic. We were perplexed to discover that next to nothing was being done in the field of computational linguistics to tackle this problem. The more deeply we thought about it, the clearer it became that a technical approach to tackling cyberbullying on social networks would have to be a combination of computational linguistics for effective detection and reflective user interaction techniques for changing user behavior. Since that time, we have been lucky to work with a couple of social networking websites and with other collaborators from both within and beyond the Media Lab. This past March, we were invited to the White House to participate on a national summit on tackling bullying led by the President and First Lady, where a collaboration between the Media Lab and the social networking website Formspring was announced. Since that time, the White House has connected us to MTV, with whom we are now collaborating. This week, the Department of Education held a follow-up summit where Secretary of Education Arne Duncan announced that MTV, in partnership with the MIT Media Lab, is opening the corpus of teenage stories on subjects related to cyberbullying for the wider research community at the website athinline.org. In a world where applied natural language processing and user interaction design tend to revolve around commercial applications, precious little is being done on tackling this very serious social problem. We are so excited here at the Media Lab to draw from varied disciplines such as psycholinguistics, affective computing, adolescent psychology, sociology and then apply it to exert the full power and weight of natural language processing, machine learning, and human-computer interaction to develop a practical and empathetic solution that social networking websites can actually implement. And we find this work to be deeply inspiring. As part of my research at the Media Lab, I have explored how the social and technical infrastructure of online communities contribute to their successes and failures. I am fascinated by the culture that emerges out of these online spaces. I have been doing this work in the Scratch Online Community, a website I developed with my colleagues in the Lifelong Kindergarten group, where close to one million children from around the world have created, shared, and remixed more than two million animations and video games. More recently, I've started to study other online communities as well. This summer, as part of a Media Lab-CSAIL student collaboration, we published a study on the role of online anonymity and ephemerality in a large and controversial discussion board. Like many others, I've been intrigued by the intersection of social media and civic engagement. Recently I wrote a short piece that examines the use of social media in the continuing drug war in Mexico. The original blog post, titled Shouting Fire in a Crowded Hashtag was later republished on ReadWriteWeb, which attracted some interest. Here are some of the highlights. One of the many casualties of Mexico's continuing violence has been freedom of the press. The local media are caught in a battle between censorship and control from both drug cartels and local governments. Some newspapers, in order to stay safe, have officially announced a policy of self-censorship when it comes to reporting drug war-related news. Because the mainstream media can no longer fulfill its role of informing citizens, people have turned to social media. Last year I started to collect tweets related to the Mexican violence. I decided to do some simple word-count analysis in one of the data sets, and found how people follow a hashtag or keyword to report warnings and request confirmation from others about shootings in various parts of the cities affected by the violence. In several cities, these hashtags have emerged as a shared news resource where many people contribute what they see and hear to help one another. I also found how a handful of often anonymous people have become reliable information hubs that send and receive thousands of messages from other citizens. Twitter has now become one of the primary sources of citizen-driven news in Mexico. Many people don't leave work or home before checking Twitter to know which areas to avoid. Having this information can actually save people's lives. While I was doing this analysis, rumors broke out on Twitter among users in the Mexican city of Veracruz: children were being kidnapped by one of the drug cartels. The governor dismissed the rumors on his Twitter account, but by then the city had already turned into chaos. Parents in panic left work to get their children from school, causing massive traffic jams, and there was generalized panic. It is still unclear what actually happened that day, but the official version is that the rumor was completely false. The government filed terrorism charges against 16 of the Twitter users that spread the rumor. Three of them are now in jail facing sentences of up to 30 years. The Mexican Twittersphere and organizations like Amnesty International have voiced concerns on the excessive use of power. Where does the Media Lab fit in all this? I think this particular case of the role of social media in the Mexican drug war emphasizes some of the many challenges and promises of social technologies. As these social computing systems permeate most spheres of life–from education, to civic engagement, to entertainment, to science–the role of technology designers goes beyond any traditional discipline. This is why I think the Media Lab is in a privileged position to have a big impact in this area. Beginning with the work of Judith Donath in the 1990s, the Lab already has a long history of research in this area. As my time at the Lab is coming to an end, I am excited to see people like César Hidalgo, Sep Kamvar, and Ethan Zuckerman join the faculty and continue this work by approaching this complex and exciting research area with interesting and different perspectives. This work requires a diversity of approaches, from building systems to studying them and their social impact. I look forward to seeing where this work goes over the next few years. Andrés Monroy-Hernández is finishing his PhD at the MIT Media Lab. You can follow him on Twitter. Media Lab "Members" instead of "Sponsors"
One of the most important things I’m focusing on is the Media Lab’s relationship with our sponsors. Having worked with sponsors, and having fundraised for a variety of organizations, I believe the best relationships are those that are not purely transactional. When the relationship is based primarily on financial support, this sometimes causes strange power relationships and limits the field of exploration. Rather, I like working closely with funders/sponsors/members on a shared mission–exchanging ideas, coming up with new ideas, and building things together. I want to get away from the idea that a sponsor is paying money for someone else to be smart, interesting, or productive. I believe that we really need to build a community–a kind of "tribe." To better convey this, from now on I'm going to start calling the companies that support the Media Lab "members" instead of "sponsors." Membership will not primarily be about financial support, but rather about the wisdom, inspiration, and reach these member companies can offer. It will also be about how they can enhance our ability to pursue our vision and impact the world. We will look for members who wish to join our community as active participants and contributors. As part of pushing the Media Lab to be more of a platform than a container, the other thing that the Lab can do is help our members work with each other to create and participate in ecosystems of services, products, ideas, culture, and policies. I think it's essential in today's environment to think about ourselves more as a network, and I believe "members" helps convey this. This week marked perhaps the most important annual event at the Media Lab: our welcoming a new batch of students, an event that infuses new blood and talent into the Lab’s 24 research groups. I met many of the new students earlier this year, in April, when they were here for their 'preview event,' and it was really nice to see them again. It seems like only yesterday that I spent my first day at the Media Lab, and I cannot fathom how quickly time has gone by. As I enter my second year, listening to the new students has forced to me reflect on my own experience here. On our very first day, we visited every research group at the Lab to learn a little about what they were working on and how we might get involved. I was nervous and excited at the same time. Nervous because everyone I met seemed to be so intelligent. Excited because of the sense of creativity and the aura of coolness. And what a year it has been! I’ve interacted with some of the most brilliant and thought-provoking academic stalwarts of our times. I've met with CEO's and executives from many influential companies. I've even been fortunate enough to have been invited to the White House. For those just coming to the Lab this week, I want to tell you that you certainly will experience many ups and downs during your time at MIT. But overall, to borrow an oft-used American phrase, “You’re in for one heck of a ride.” And remember…. You did not arrive here by accident, and no matter how modest you might be, you must be very talented and gifted. You've been chosen from hundreds of smart people, and you deserve to be here. I've always been a huge fan of Albus Dumbledore and Gandalf. If you've ever felt that you wanted to meet a real-world similarity, it’s you’re in luck. You will, from time to time, watch many polymaths ambling through the Lab when you least expect it. Marvin Minsky, the father of modern AI is perhaps the most famous polymath here, but there are many others: Henry Lieberman invented garbage collection in programming languages, and is a pioneer in intelligent user interfaces. Rosalind Picard invented affective computing, and is a leader in autism theory and technology. Mitchel Resnick was involved in the creation of LOGO for kids, but is also a leader in inventing tools to the meet the information needs of information communities. Every PI here has deep expertise in at least a couple of fields. In the Media Lab, there are no required courses, and no established curriculum. You can choose and pick any course offered through the Lab’s academic Program in Media Arts, other MIT departments, or even Harvard. Choosing what course to take is a bit like being a kid in a candy shop. My heuristic has always been this: take a course if it you need it for your research, and always attempt to write a conference-quality paper at the end of it. For me, this has resulted in some very long-lasting collaborations with other groups at the Lab. The January Independent Activities Period, the month between the fall and spring semesters, is an excellent time to sharpen your creative acumen. You can experience anything from wine tasting to hummus-making courses. If you've never done pottery, or have had a desire to make your own glass sculptures, this is your time to try it. It almost always helps you to unleash your creative self when the spring semester gets underway. Last December, I was lucky enough to get involved in planning the end-of-year party. It was great getting involved in a Lab-wide event and I encourage you to jump in and do the same. I still feel that same way about MIT as I felt the first day I got here. I'm inspired everyday when I walk to the Lab through the Infinite Corridor. From giving birth to modern-day information theory to discovering synthetic penicillin, this place has done so much for humanity. The coolest thing is that you are now part of this family. It's your turn to be unconventional. Welcome to a most remarkable place! Karthik Dinakar is a second year graduate student in the Software Agents group at the Media Lab. The Media Lab is considering a potential revision of its IP policy. In order to ensure an in-depth analysis of the Lab’s relationship to IP, its past and current strategies, as well as evaluate possible future policies, the Lab is putting together a commission of both internal faculty/MIT researchers and external IP experts. The commission will be facilitated by a field researcher, Kate Darling, and convene periodically during the course of a year to review gathered insights, refine questions, and set the direction for the analysis. The field researcher will investigate the Lab’s historical and current relationship to IP, spend time in the Lab developing an understanding for the various innovation contexts and their relation to IP, collect input from all involved parties, and connect the gathered insights to theoretical work on the role of IP in networked innovation settings. On the basis of this field work, the commission will discuss suitable policies for the Lab and draft a report with recommendations. Questions include (but are not limited to): The role of IP rights in the Lab’s sponsoring strategies; the importance of IP rights to the Lab itself, including their value to faculty and students; the relationship between the Lab’s policies and MIT’s IP policies; the general role of IP in the various fields of innovation that the Lab engages in; whether any aspects of the current policies are causing unnecessary hindrances; whether the policies can be modified to encourage innovation (both internally and in a more general, social context) and also reflect the ideological interests of the lab; and whether there are any IP-related initiatives and projects that the Lab could support or be engaged in that use IP in a creative way to solve problems or enhance innovation and invention. The commission will be chaired by Lawrence Lessig and we hope to have a very broad range of view represented on the commission. We are in the process of compiling the list of candidates for the commission. We're also soliciting participation from students, faculty and staff to participate in the process. (Contact Kate if you're interested.) We'll also be working closely with our sponsors/members and other stakeholders. I'm very excited about this initiative and also excited to that Kate Darling has started her work at the Media Lab this month. Please join me in welcoming Kate and please provide Kate and myself with any thoughts as we begin the process. 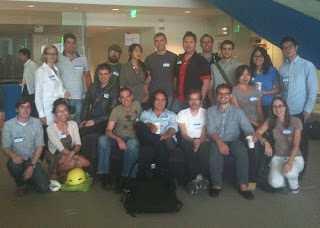 Welcome to our new Media Arts and Sciences grad students. Here are as many of them as could be rounded up into one place at today's meet-and-greet gathering. Welcome to the new MIT Media Lab blog. This is one of the many exciting changes you’ll be seeing from the Lab over the next several months as we work to give more people the chance to participate in the very cool things going on here. When I first started hanging out at the Lab, I noticed that while there was a lot happening, it felt slightly more like a container than a platform. There were lots of collaborations with outside groups–and many people travel out as well as visit in–but the awesome space that the Lab lives in, and the somewhat tricky issues around IP and confidentiality, have kept a lot of the great things going on at the Lab out of the public view. I'd really like to have the Media Lab be more involved in the conversation that is the global Internet, and to invite everyone to participate in what we do. So in addition to initiating this blog, we will be streaming more of our talks, inviting more external people to our meetings, and exploring ways to adopt more permissive licenses for our content. I officially come aboard as Lab director this month (yay! ), so this just the very beginning of what I think will be an interesting journey and look forward to having everyone along for the ride. This is a "soft launch" and we're looking for feedback. So please let us know if you have any ideas or suggestions on what else we should be doing or how we can improve what we already do.